ShutterstockThe FBI reports the average loss per burglary is more than $2,000, and during the holidays, you can take an even bigger hit. The holiday season is upon us, and while you might be decorating your apartment door with boughs of holly and prepping your Thanksgiving turkey, you should also be arranging for something else: to get covered with renters insurance. Your landlord or property management company has insurance that covers the walls, floors and ceiling of your apartment, but everything inside it is your responsibility. This means your designer clothes, your expensive TV, all of your furniture and the gifts you've purchased aren't covered if anything happens. And the majority of renters aren't covered. According to a 2013 Rent.com survey, 60 percent do not have renters insurance coverage. 1. Home fires are more frequent during the holiday season. A home fire occurred every 85 seconds in 2013, according to the National Fire Protection Association, and a study by Allstate Insurance found that home fire insurance claims increase by 15 percent during the holiday season. The candles, Christmas trees and space heaters that fill your apartment during the winter make for very high fire risks. Candles. Candles are one of the biggest culprits of home fires, and according to the U.S. Fire Administration, fires caused by candles are as much as four times more likely during the holiday season. In fact, the National Fire Protection Association reports that from 2007 to 2011, 11 percent of home candle fires began with decorations in December, compared to only 4 percent the rest of the year. Christmas trees. While beautiful, your Christmas tree is another fire hazard, and damages can be costly. Allstate reports the median cost for a home fire claim caused by a Christmas tree is more than $100,000, and 1 in every 22 Christmas tree-related home fires results in death, according to the NFPA. Space heaters. From 2007 to 2011, space heaters accounted for one-third of home heating fires and 81 percent of home heating fire deaths, the NFPA reports. Half of all home fires caused by space heaters occurred between December and February. Renters insurance will protect your possessions in case a fire occurs. Even if the fire happens in a neighbor's apartment, renters insurance can protect your belongings from smoke damage. The holiday season is also a perfect time to check your smoke detectors to ensure they are functioning properly. A working smoke alarm reduces your chances of dying in a fire by nearly half, according to the NFPA. 2. In the U.S., a home break-in occurs every 15 seconds. According to the FBI, there were more than 2 million burglaries in 2012, or approximately one every 15 seconds. If that's not already often enough, Allstate Insurance found that theft claims increase by 7 percent during the holidays. You know the big stacks of expensive gifts waiting to be doled out to your family and friends? Well, burglars know about those, too -- especially if you do your shopping online and have packages outside your door. 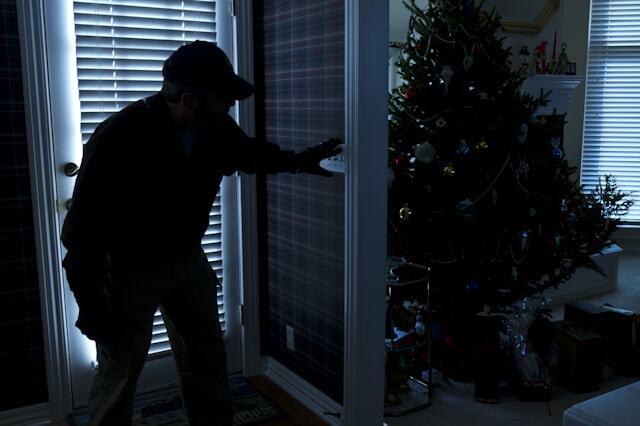 The FBI reports the average loss per burglary is $2,119, and during the holidays, you can take an even bigger hit. Replacing gifts, electronics and other possessions can add up to an astronomical amount quickly, and that's not to mention those irreplaceable heirloom earrings passed down from your grandmother. Along with keeping your valuables out of sight and making sure your apartment is locked up tight with or without you in it, get renters insurance -- you don't want to be in the position of paying out of pocket to replace everything you lost in the event a burglary happens. 3. Slip-and-falls account for more than 1 million emergency room visits each year. Your health insurance will likely cover the expenses that go along with a personal injury, but renters insurance will cover liability if a visitor gets injured in your home. During a time when snow and ice tracked inside can make floors slippery, drinking at holiday parties makes people a little careless. So it's more important than ever to be sure you and your visitors are covered. If you don't have renters insurance, getting covered is easy and affordable. The average cost of a renters insurance policy is only $15 to $30 per month, and the peace of mind during a stressful holiday season is priceless.